I was on a group bike ride. 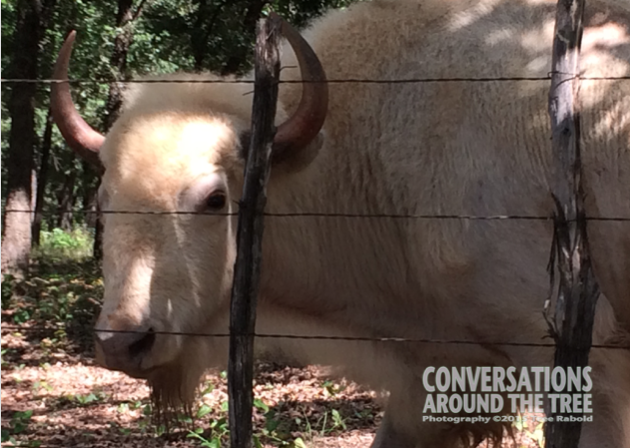 We were just rolling up to a rest area and I noticed this white buffalo across the road. I have no idea if buffalo are aggressive. His friend grunted at me a little bit but this guy seemed quite pleasant! Besides sticking his tongue out at me!! Is he sticking his tongue out at me?! 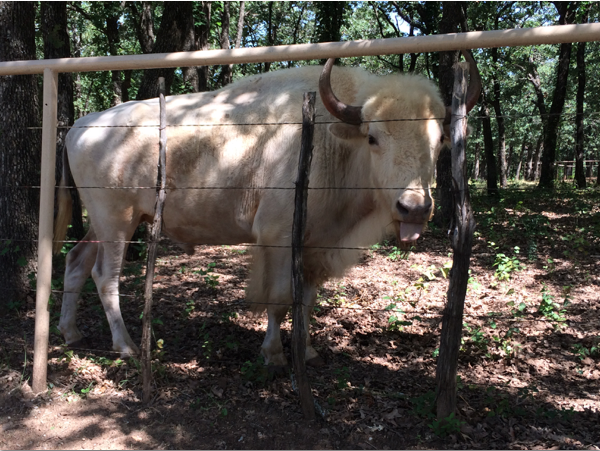 This entry was posted in Uncategorized and tagged 365 photos, white buffalo on July 11, 2015 by treerabold. I think so too Stacy!! Thank you so much for sharing this article. I knew the white buffalo had a significant role but I did not know the story. If I can just get a bit technical here. .. This is a bison (Latin is ‘bison bison’ funny!) Not a buffalo. It is common mistake here. Buffalo are in Africa. However, yes as Thumbsup already posted, American Natives covet the white bison as a spiritual creature. If we wake up today. And skins for a roof. We wake up on today. Thank you Plant Girl for the correction. I had no idea there was a difference. I also appreciate you taking time to sing to me this morning!! The acres of land, the countless creatures and the endless numbers of cultures….all destroyed by the “white man.” In the name of progress? God? Financial gain? wow, a white buffalo? That has got to be very unusual. very cool!